At the same time the axe became a weapon of choice among Norwegian warriors, society collapsed and warfare became a free-for-all. This is the crux of a doctoral dissertation that researcher Ingrid Ystgaard will defend this spring at the Norwegian University of Science and Technology. 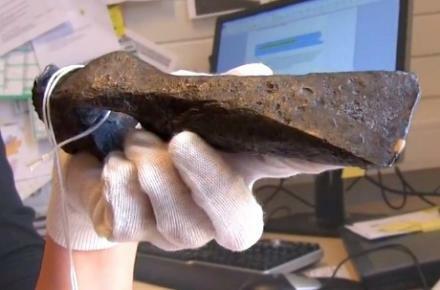 She has studied weapons found in graves and the battle techniques they suggest during the transition from the early to the late Iron Age. The division between these periods was around 500 AD. This was the time when the Western Roman Empire collapsed, and the warfare practices of Southern Europe lost their foothold, even in the High North. Major alliances were splintered and smaller bands of men started warring against one another. And significantly, the battle axe became a favoured weapon. Ystgaard has studied and written about the simple stone fortifications that were built for protection on hilltops or other sites that were easy to defend. Research shows these fortifications were only in fashion for a while. They were relatively common and were maintained from around 400 AD to 600 AD. Then, perhaps over the course of a single generation, they were abandoned and left to crumble. Ystgaard wondered why people gave up fortifications that had been used for more than six generations. 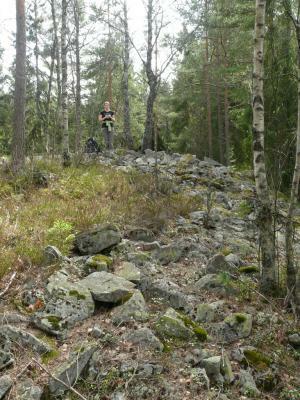 She found one answer in some 100 weapon graves in mid-Norway. These are ancient graves where the dead were buried along with the weapons they had carried. At the start of the period she studied – from 400 AD till nearly 500 AD – the Western Roman Empire was still intact and its warfare practices were still having an effect on life as far away as Northern Europe. “The Roman Empire’s weapon technology and warfare set the standards not just in the Empire and its provinces, but also here, in free Germania and up through Scandinavia. The arms we find until the 500s are a Germanic adaptation of Roman legionnaire equipment,” explains Ystgaard. The standard weaponry prior to around 500 AD included the double-edged sword, lances, javelins and shields. The idealised Roman battle stuck to rather well-organised rules as far as warfare went. Two armies faced each over and soldiers began the fight by hurling javelins at each other. With a little luck this could take the enemies’ shields out of the picture or kill them with a direct hit. Then the armies would clash, jabbing with lances and trying to break each other’s lines. The object would be to get around behind the enemy. Once that was accomplished, swords could be used in close combat. There was no need for an axe in this type of battle. Nevertheless, around 500 AD axes started appearing in warrior graves. “The axe can be used as a weapon against another person, but also as a tool for breaking into something. If you stop staging large battles in the field, but try and take out the boss where he can be found, in a raid on his home, then you need an axe. This is a completely different principle for warfare,” explains Ystgaard. Ystgaard’s main theory is that the fall of Rome had consequences in the north, outside the Empire. Continental Europe was in crisis and important trade partners as well as sources of inspiration and knowledge vanished. This led to a local crisis in distant Norway. “As I interpret it, the onset of the axe and the use of fortifications are interlinked. Warfare started to be directed toward people of the same social order. War used to be focused on other regions, but now the warlord in the neighbouring rural district was the enemy,” says Ystgaard. “It was kind of a free-for-all. You get a bunch of warlords who build fortifications and have their own troops of followers and they are trying to steal from each other. These were very rough times." But nothing lasts forever – not even anarchy like this. Suddenly, in just a few years around 600 AD, the stone fortifications go completely out of style. Ystgaard thinks the costs of everybody fighting one another probably grew too excessive. “This is such an unstable system − it was no longer viable. By around the year 600 most of the smaller chieftains had been vanquished, there were just a few rulers left. Then you get a new concentration of power in the country,” she says. This formed the foundation for centralising power among a few major chieftains, or petty kings. From that it was just another 200 years before the famous attack at Lindisfarne in England – the start of the Viking Era.